One of my favorite viral images was this one to the right that started getting passed around about a year ago. 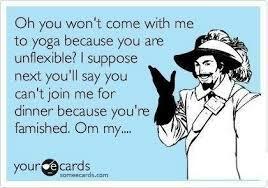 “I can’t do yoga because I’m not flexible enough.”-The Many Athletes out there not doing yoga. Athletes can do amazing physical feats but it’s so funny how often they shy away from the things that don’t come easy to them. Many athletes snub their nose at yoga before they even try saying it’s too easy and not a good enough workout. Sam says, that the irony in that is the ones who do try a class don’t continue because they can’t twist into a pretzel like the girl in the front row. Most athletes are used to being naturally good at something. Yes an athlete then works very hard to improve those natural skills, but it’s funny how quickly they quit something that doesn’t come naturally easy. 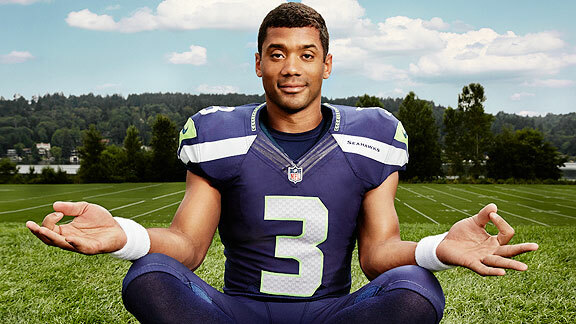 Very quickly major professional athletes are beginning to catch on yoga for athletes. As an athlete if you can let go of your ego, you too will find that yoga can do amazing things to improve your athletic performance. Most athletes have tight hips, shoulders, hamstrings, calves, feet the list goes on and on. Some athletes take the time after a workout to do a regeneration session using foam rollers and/or trigger point massage therapy, but these sessions are usually hurried through so one can get home and get a good meal. A yoga class sets aside time specifically to stretch. A hot yoga class provides the heat necessary to prime your muscles for stretching helping increase flexibility even more. As athletes know flexibility is important for proper range of motion, increased muscle recovery time, and injury prevention. At least one yoga class a week provides time specifically for these benefits. In order to actually improve your ability to do many yoga postures, you are actually preforming an isomeric muscle contraction. Take Pada Hastasana (Hands to feet Pose) for example you use your biceps, quadriceps, latissimus dorsi, and abdominal strength to open up tight hamstrings. While doing this posture, not only do you strengthen the muscles you are using, open up and stretch your tight hamstrings, but you also train the body to be able to use multiple muscle groups at once while relaxing other muscles groups gaining more body awareness a very important aspect of elite athletic performance. Yoga not only increases your muscular strength and awareness, but it does it in a low impact way. Many athletes don’t actually hurt themselves on the field, but rather in their training. Yoga provides a low-impact cross training that will help an athlete get stronger without further breaking their body down. Standing Bow combines Balance with using your strong glutes and quads to open up hamstrings. A posture an athlete can quickly become better in when they focus their energy correctly. Many yoga postures incorporate balance, improving ones ability to be stable on one leg. The more stable you are on 1 leg, the better you will be on 2. All sports involve balance in some way, yet many take the time in practice to improve it. Working on your balance in a yoga class will give you an upper edge on the sports field. The glutes and quads power you to change directions, but it the smaller supportive muscles that keep you from tearing your ACL. We’ve already mentioned that yoga is good for increasing flexibility which also leads to decreased probability of tearing muscles. Yoga can also help prevent common sports injuries such as torn ACLs, Minicuses, Rotator Cuffs, ankle strains and sprains. When you do yoga, you learn to recruit the smaller supportive muscles that you don’t activate when doing tradition strength training. These supportive muscles not only make you stronger, but also are the ones that will help protect your joints while your power muscles are performing athletic movements. If it’s good enough for the 8-1 Seakhawks it might be good for you! It isn’t any secret that the more you focus on any particular task, the better the performance. When you take a test, the teacher provides a quiet environment. This isn’t the case when you’re on the field. There are fans, coaches, and opponents creating constant distraction, yet few sports team take the time to train their athletes to focus. Focus is a key component to yoga. Not only will the focus learned in yoga help you have more body awareness and control improving balance and injury prevention, but it will also make your reflexes quicker allowing you to be one step a head of your opponent. Most athletes quickly transition to shallow breathing as soon as their heart rate increases. Yoga trains you to use your full lung! The first step of any yoga posture is breath. A good instructor will tell you if you can not maintain normal breathing (long slow inhales and long slow exhales) you aren’t actually getting the benefit of the posture. Controlled breathing reassures the brain that you are in control. It also decreases circulating carbon dioxide a trigger that causes your heart rate to increase. Controlled breathing naturally allows your heart rate to decrease allowing you to actually work harder. Yoga trains you to be comfortable maintaining normal breathing. When you take longer inhales, you actually breathe into the deeper bronchial branches of the lung allow more surface area for your blood stream to take up oxygen (fuel for your muscles). Your working muscles then utilize that fuel turning it into carbon dioxide. When you take a longer slower exhale you are able to get all the metabolic waste out allowing a larger percentage of oxygenated air to get in with your next breath. The physical presence of more oxygen to fuel your muscles with the mental perception that you aren’t working as hard when you heart rate decreases allows you to have a larger work output than you would otherwise. Over time as you develop this skill in the yoga room, it transfers over to any other endeavors that increase your heart rate making you much more efficient at breathing and providing the oxygen your muscles need to function. If you are planning to workout at home with a recumbent bike, these are the things to consider when choosing a recumbent bike. Go in with an open mind. If you think yoga is a waste of time, it will be for you. Breath. The first step of every posture is normal breathing. If you can’t maintain long slow inhalations and long slow exhalations your body isn’t relaxed and you won’t be able to get the full benefits of the posture. Take it easy, Leave the win or lose mentality at the door. As long as you are trying your best and breathing you will get benefits. The first law of yoga is non-violence and that starts with yourself. If you are forcing yourself into a posture you are liking to tear a muscle causing injury…the exact opposite of what you’re looking to achieve. Enjoy the relaxation. Don’t fight it. Relaxation is built into yoga to help clear and focus the mind. Make yoga a regular routine. Treat your yoga practice the way you would treat any other aspect of your training. If you don’t do it regularly you won’t get the benefits. Listen. Don’t take corrections from a teacher negatively. Teachers are meant to help you. If a teacher tells you to relax you probably aren’t following the first 2 bullet points. This is often the case when athletes first start yoga. Smile as you practice. It makes the experience better.